Gary Anderson was a man of many talents. He left behind a legacy his family is proud of and follows to this day. Gary and his two younger brothers, Ralph, who was three years younger and Jimmie Lee, who was six years younger than Gary, all grew up in Griffin in a home on Stark Avenue. “We were not rich at all, but what we had in our home was the love of our mother and our grandmother,” said middle brother Ralph Anderson. Gary’s mother, Estella Anderson worked at Griffin Laundry, then Bunn’s Laundry and lastly Thomas Packing Company, to support her growing family. Gary’s grandmother, Nannie P Anderson also lived in the home helping raise the young boys and making ends meet. “They were oh, so good to us,” brother Jimmie Lee said about his mother and grandmother. “They were good but taught us tough love. We knew not to get out of line in or out of our home. They raised us right,” the youngest brother remembered. According to both brothers, Gary was the typical young man growing up in Griffin. He enjoyed the sports most young men enjoy. He played in and around the neighborhood with his friends. Brothers Ralph and Jimmie Lee both remember Gary being someone who was, “happy with life overall.” The family attended Northside Baptist Church off North Third Street together. One of Gary’s many talents was working on cars. “He especially liked Fords. Yes he was a Ford man,” Jimmie Lee noted. And there was nothing on a car Gary could not fix or repair. He would take motors completely out of cars, put them back together and make the cars he had run better… “and faster,” Ralph laughed. Another talent Gary had was cutting hair and barbering. Gary would begin by cutting the hair of his youngest brother Jimmie Lee. “No it didn’t look too good, that’s for sure. I was his ‘crash test dummy'” smiled Jimmie Lee. But as Gary worked his craft, he got better and better. Eventually getting to the point where customers would come by his home paying for their haircut. The extra money came in handy around the Anderson household. “Their haircuts looked a lot better than mine did,” Jimmie Lee grinned. Another of Gary’s many talents was singing. “Gary was a good singer. He could really sing,” said his lifelong friend Gwendolyn Berry. Garry’s favorite music was “sol music and the music of the day,” Gwendolyn recalled. Gary attended local Griffin schools; Moore Elementary, AZ Kelsey Middle School and Fairmont High School, from where he was drafted into the US Army. His first assignment was training at Fort Benning, GA. Military life seemed to be a good fit for the young man. When he came back to Griffin to visit, he wore his uniform and “he looked so good,” the brothers agreed. Gary’s family took him to the Atlanta airport when the visit home ended. It is something neither brother would ever forget. Soon after, Gary would head to Vietnam. 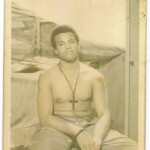 Gary served in the jungles of Vietnam with valor and courage. 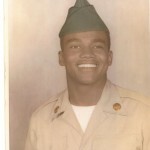 When his duty assignment was over, Gary and dozens of other soldiers loaded onto the military passenger transport plane. Next stop… home… the United States of America. The plane load of weary soldiers home at last from the horrors of war. But home was never to be a part of the plane’s flight plan on that fateful trip. Soon after takeoff the plane Gary and the soldiers were on crashed, November 29, 1969. Gary had celebrated his 20th birthday only four days before his untimely death. After 46 years Gary Anderson is rightfully honored by a family, community and nation that loves him. Welcome home our braves soldier.